Footsteps announced the arrival of the Agents. They were sooner than expected. Spring gestured for the Wabbit to snuggle close and then they rubbed ears. The Wabbit felt his fur tingle as they almost vanished - but not quite. They shimmered in the light, neither here nor there - all the Agents saw were confused shadows and ghostly images. "I don't like it here." The first Agent's name was Squatpump and he had a voice like a factory siren. Thrasher, the second Agent watched him. "Lift the slab, Squatpump." There were several grunts. 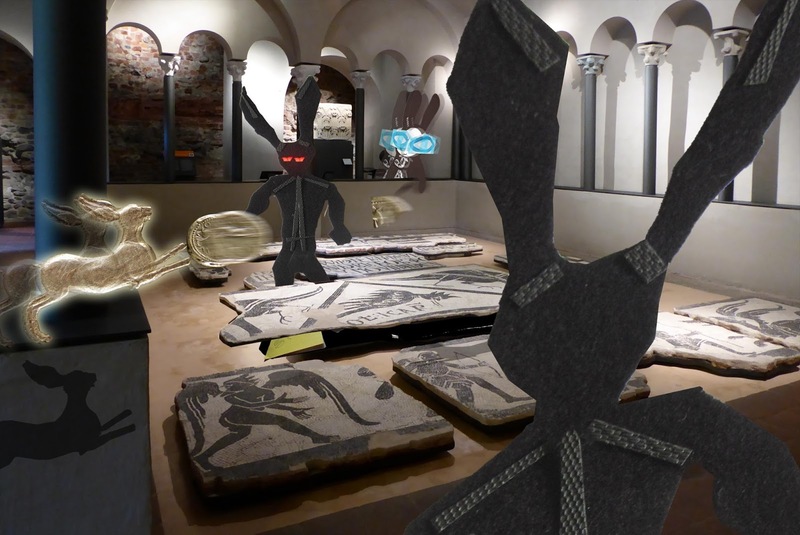 As the Wabbit watched the Agent lift the slab, he slid his paw into his fur and drew out the coin fragment from the museum in Siracusa. Spring summoned a rabbit coin that gave off a ghostly glow as it began to spin. Then he rolled it across the floor. "What's that clinking clanking sound?" asked Squatpump. The Wabbit pitched his coin fragment and it skipped noisily to Squatpump's feet. The Agent dropped the slab on his toes. "You idiot!" yelled Thrasher, "Look there's a note, get it!" Squatpump picked up the note with difficulty and tried to read it. "I can't read joined up writing," he moaned. Thrasher grabbed the note and turned it the right way up. "So was it does say?" whined Squatpump. Thrasher grimaced. "It says abandon hope."